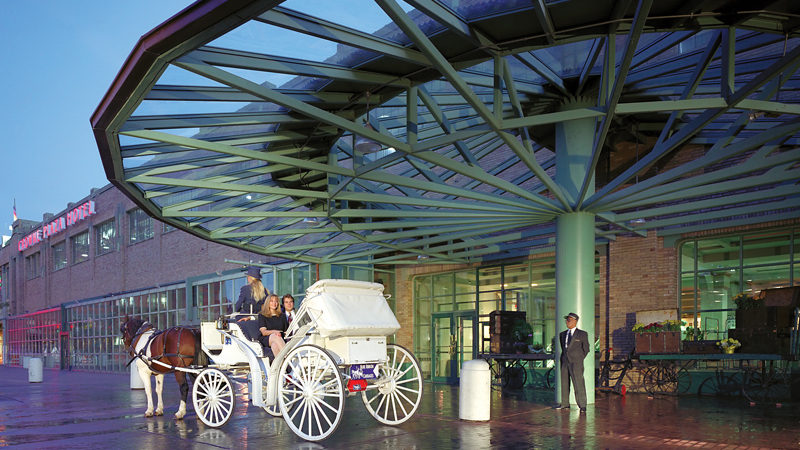 Welcome to the Crowne Plaza Indianapolis Downtown Union Station. From train car hotel rooms featuring upscale modern amenities to a downtown location connected to Lucas Oil Stadium and the Indianapolis Convention Center, our hotel's accommodations promise a convenient home away from home in a unique, historic setting. 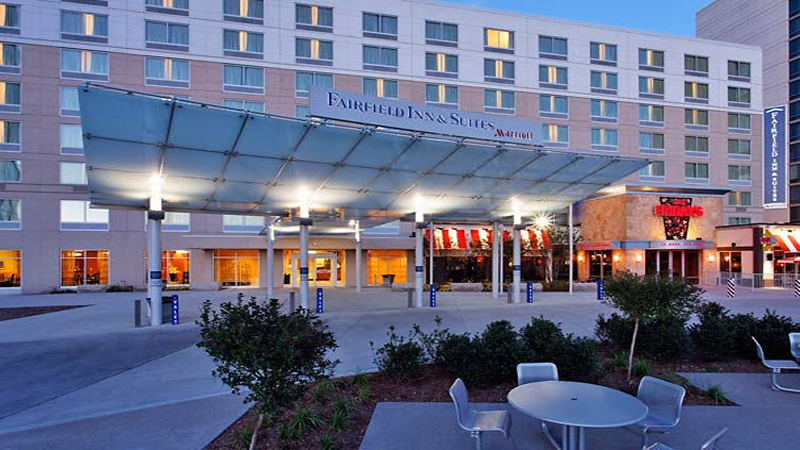 Work hard and play hard when you reserve your stay at Fairfield Inn & Suites Indianapolis Downtown. Each room and suite at our hotel comes equipped with cotton-rich linens and a comfortable pillow top mattress. Check your email or your newsfeed with our ergonomic workspaces featuring free high-speed Wi-Fi. Built for your convenience, we provide a skywalk connecting the hotel directly to the Indiana Convention Center. Fuel up for your day with our hotel's complimentary continental breakfast featuring a wide selection of fresh fruit and pastries, then return in the evening for your favorite meal at our T.G.I. Friday's. Workout routines are maintained in the fitness center featuring modern cardio equipment and free weights. In your free time, visit attractions near our downtown hotel such as Lucas Oil Stadium and Indiana State Museum. We are also within walking distance of a variety of popular Downtown dining and shopping locales. Travel in style as you mix business and leisure at our hotel in downtown today. Beautiful. Thoughtful. Historic. Cool. The property is known to most as the “Big Four Building”, named for the big four railroads that were headquartered here (Cleveland, Cincinnati, Chicago and St. Louis). They have preserved the ornamentation, the detailed stone and brick and the architectural highlights that put the Big Four on the National Register of Historic Places. Inside, the 180 well-appointed guestrooms will provide the perfect place for you to relax. 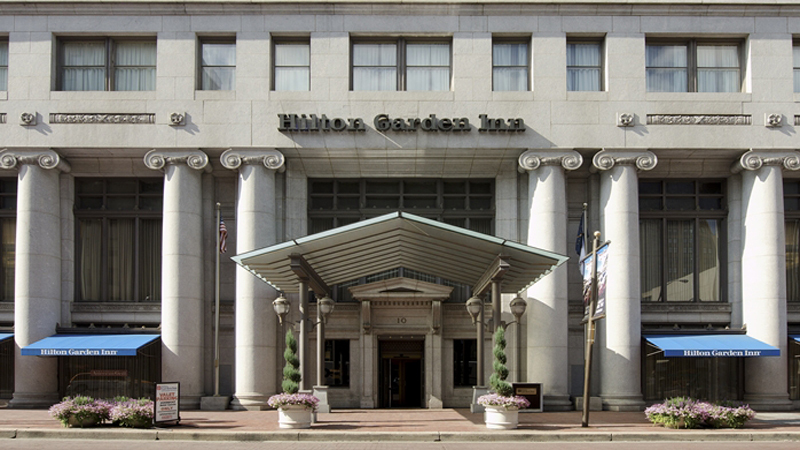 Welcome to Hilton Garden Inn Indianapolis Downtown, an Indianapolis, Indiana hotel close to restaurants, museums and shopping. Located in the heart of downtown Indianapolis, we are a short drive to the Indianapolis Airport and Indianapolis Motor Speedway, and close to corporations including AT&T and Simon. With Lucas Oil Stadium just next door and the Indiana Convention Center only two blocks away, savvy travelers know that the Holiday Inn Express Indianapolis Downtown Convention Center hotels City Center location is ideal. Moments from I-70 and I-65, this downtown Indianapolis hotels location is within walking distance of the fabulous shopping at Circle Center Mall. (Just call the hotel shuttle if you need help carrying all of the bags back!) Dont forget to pack your imagination for a trip to the Childrens Museum and the Indianapolis Zoo or catch an Indianapolis Indians baseball game all within five miles of the hotels Indianapolis, Indiana address. Youll be at the heart of Indianas business and medical industry with this Indianapolis hotels location, within two miles of Eli Lillys global headquarters, Riley Hospital for Children, Anthem, Rolls Royce, and Indiana University Medical Center. Just use the free high-speed, wired and wireless Internet access to check email and walk the two blocks to your meeting at the Indiana Convention Center. Be sure to grab one of our signature cinnamon rolls at the complimentary hot Express Start Breakfast Bar before heading out for a big day in the capital. 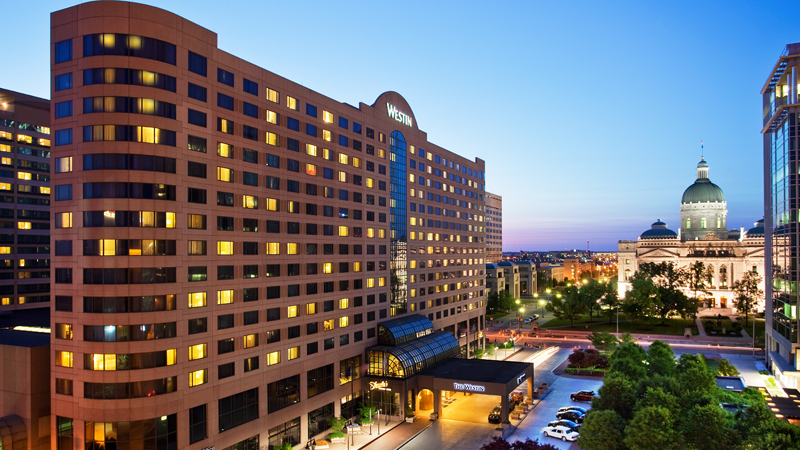 From medical professionals to professional athletes, this Holiday Inn Express Indianapolis Downtown Convention Center hotel is in the center of everything. 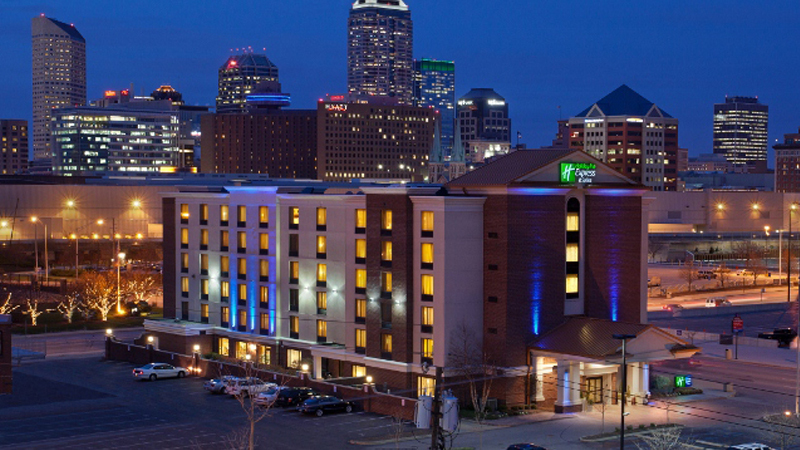 The Holiday Inn Indianapolis Downtown is a smoke-free all-suite hotel in Indianapolis and is within walking distance of the Indiana Convention Center & Lucas Oil Stadium. 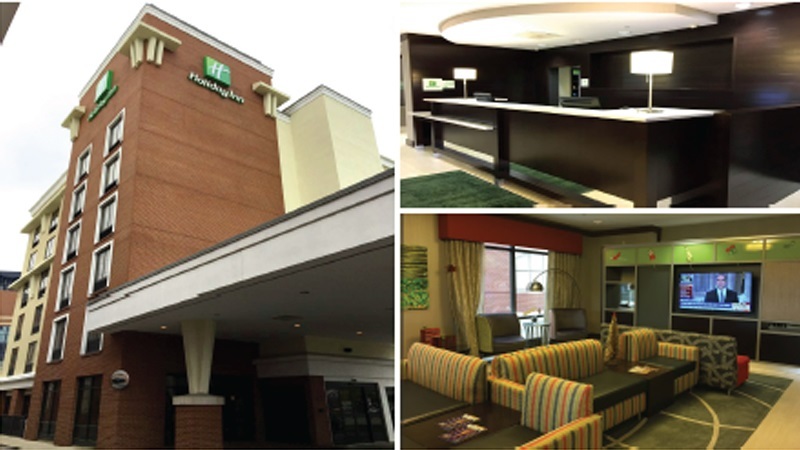 The Holiday Inn Indianapolis Downtown also offers easy access to the Indianapolis Zoo, Banker's Life Fieldhouse, Victory Field, the Indianapolis Motor Speedway, Indianapolis Museum of Art, White River State Park, The Crane Bay Events Center and Circle Centre Mall. The Holiday Inn Indianapolis Downtown is just moments from I-70 and I-65 and just 15 minutes from the Indianapolis International Airport. All guest rooms in this Indianapolis hotel come equipped with refrigerators, microwaves, coffee makers, flat-screen TVs, hair dryers, irons, ironing boards and sofa sleepers. 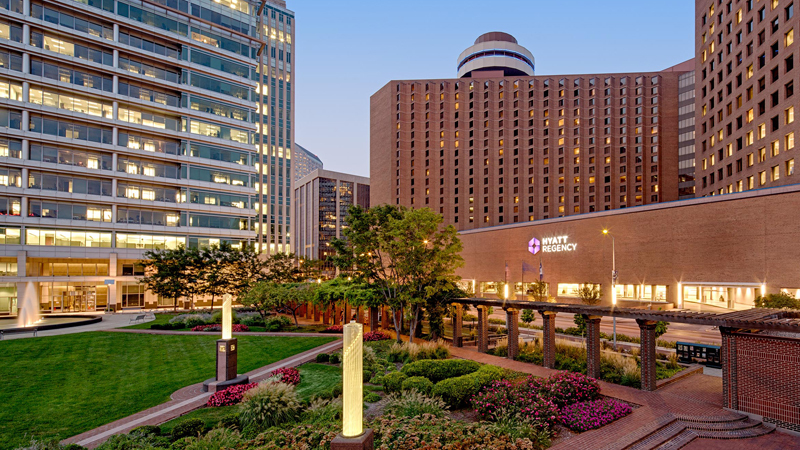 With a stay at Hyatt Regency Indianapolis, you'll be centrally located in Indianapolis, steps from Indiana Convention Center and St. John the Evangelist Catholic Church. 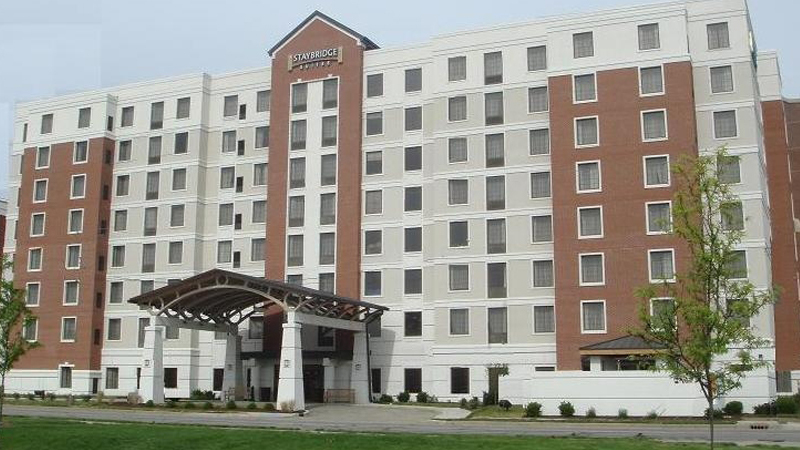 This 4-star hotel is within close proximity of Indiana Repertory Theatre and Circle Center Mall.Make yourself at home in one of the 499 air-conditioned rooms featuring refrigerators and flat-screen televisions. Wired and wireless Internet access is complimentary, while iPod docking stations and cable programming provide entertainment. Private bathrooms with bathtubs or showers feature designer toiletries and hair dryers. Conveniences include phones, as well as safes and desks.Amenities Take advantage of recreational opportunities offered, including an indoor pool, a spa tub, and a sauna. Additional features at this hotel include complimentary wireless Internet access, concierge services, and gift shops/newsstands.Enjoy a meal at one of the hotel's dining establishments, which include 3 restaurants and a coffee shop/cafa. From your room, you can also access room service (during limited hours). Quench your thirst with your favorite drink at a bar/lounge.Featured amenities include a 24-hour business center, express check-in, and express check-out. Planning an event in Indianapolis? This hotel has 35,000 square feet (3 square meters) of space consisting of conference space and meeting rooms. Self parking (subject to charges) is available onsite. 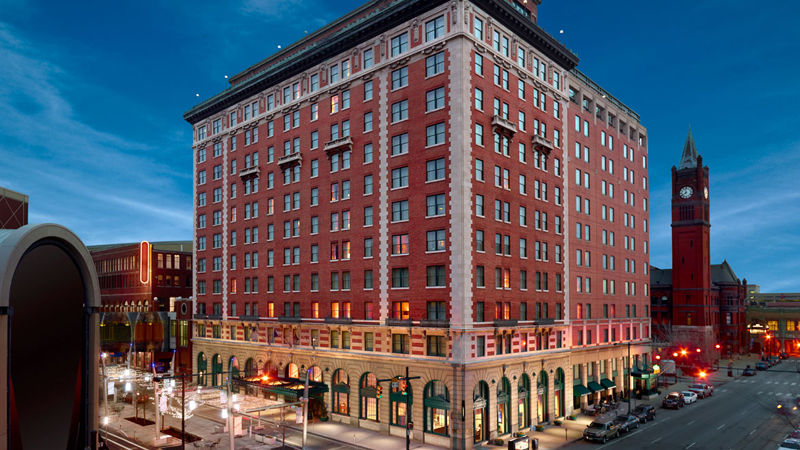 A repeated winner of the Meetings & Conventions Gold Key Award as one of the finest meeting properties, this 4-Diamond hotel in downtown Indianapolis is sure to delight any traveler. 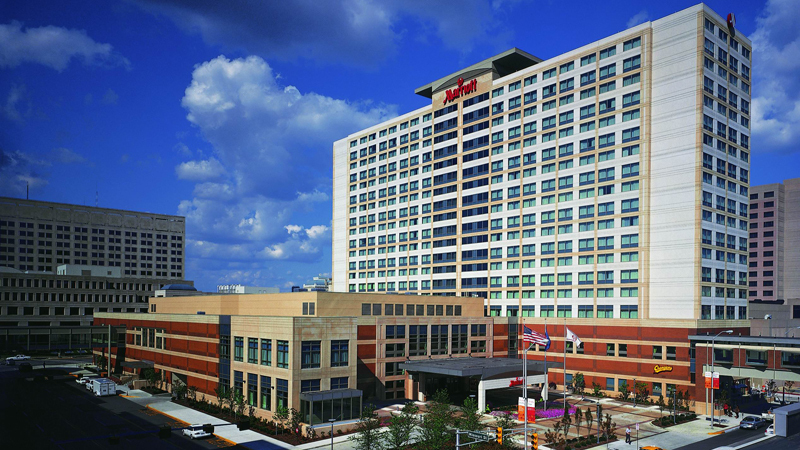 The Indianapolis Marriott Downtown boasts 622 guest rooms and junior suites which include luxurious linens, signature bath products, flat-screen TVs with HD programming and functional work areas. 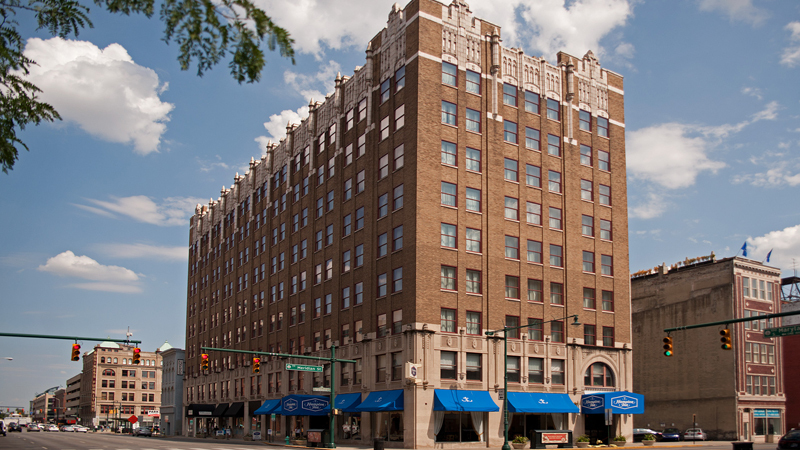 Connected via skywalk to the Indiana Convention Center and Circle Centre Mall, this downtown Indianapolis hotel is ideal for business travel, just steps from Lucas Oil Stadium, Victory Field and a short walk to Bankers Life Fieldhouse. In this sports-minded city, the Indianapolis Marriott Downtown is home to Champions Sports Bar - voted by MSN as the best place to watch the NFL or NBA in Indy and outfitted with over 25 flat-screen TVs. Just eight miles from the airport, our hotel features a fitness center, free Wi-Fi in the intimate lobby, and 40,000 sq. ft. of meeting space. 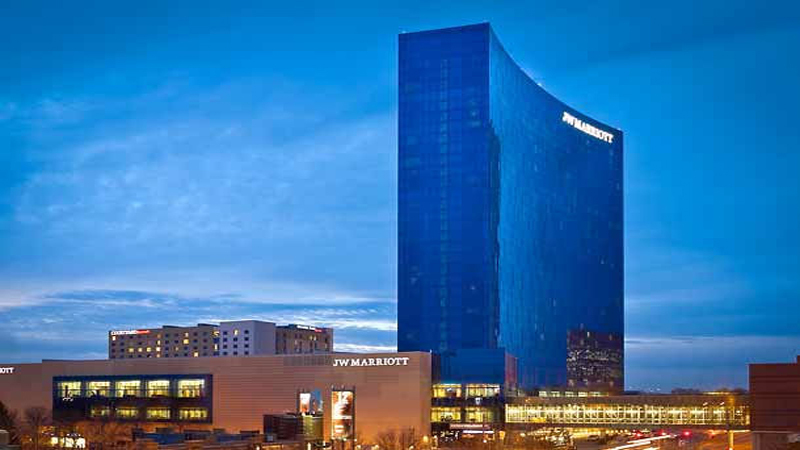 Winner of four distinct Condé Nast Traveler awards including Best Hotel in Indiana along with the TripAdvisor Certificate of Excellence award, the JW Marriott Indianapolis Downtown is a landmark amid the five Marriott hotels connected to the Indiana Convention Center. This luxury hotel in Downtown Indianapolis soars 33 stories above the city and boasts one of the largest Marriott ballrooms in the world, offering over 103,000 sq ft of meeting and exhibit space, as well as two full-service restaurants. Adjacent to the convention center, just steps from White River State Park, the Indianapolis Zoo, and many museums, our location is unparalleled. This Downtown Indianapolis hotel is in the heart of world-class shopping and dining, near the State Capitol, Lucas Oil Stadium and Bankers Life Fieldhouse. Guest rooms feature Marriott's signature REVIVE® bedding, 40" LCD high-definition TVs, marble vanities and breathtaking views of an art-filled plaza. A stay at Omni Severin Hotel places you in the heart of Indianapolis, walking distance from Circle Center Mall and Indiana Convention Center. This 4-star hotel is within close proximity of Bankers Life Fieldhouse and Lucas Oil Stadium.Make yourself at home in one of the 424 air-conditioned rooms featuring flat-screen televisions. Wireless Internet access (surcharge) keeps you connected, and cable programming is available for your entertainment. Private bathrooms with shower/tub combinations feature complimentary toiletries and hair dryers. Conveniences include phones, as well as laptop-compatible safes and desks.Amenities Don't miss out on recreational opportunities including a health club and an indoor pool. Additional amenities at this hotel include complimentary wireless Internet access, concierge services, and wedding services.Grab a bite to eat at the hotel's restaurant, which features a bar, or stay in and take advantage of 24-hour room service. Relax with a refreshing drink at one of the 2 bars/lounges. Cooked-to-order breakfasts are available for a fee.Featured amenities include a business center, express check-in, and dry cleaning/laundry services. Planning an event in Indianapolis? This hotel has 24000 square feet (2230 square meters) of space consisting of conference space and meeting rooms. Self parking (subject to charges) is available onsite. With a stay at Staybridge Suites Indianapolis Downtown - Convention Center in Indianapolis (Downtown Indianapolis), you'll be minutes from Lucas Oil Stadium and close to NCAA Hall of Champions. This hotel is within close proximity of Victory Field and Indiana World Skating Academy.Make yourself at home in one of the 113 air-conditioned rooms featuring refrigerators and microwaves. Wired and wireless Internet access is complimentary, while DVD players and satellite programming provide entertainment. Conveniences include desks and coffee/tea makers, as well as phones with free local calls.Amenities Don't miss out on recreational opportunities including an indoor pool and a 24-hour fitness center. Additional amenities at this hotel include complimentary wireless Internet access, concierge services, and gift shops/newsstands.Grab a bite from a grocery/convenience store serving guests of Staybridge Suites Indianapolis Downtown - Convention Center.Featured amenities include a business center, dry cleaning/laundry services, and laundry facilities. Self parking (subject to charges) is available onsite. Travel can be draining—that’s why we offer numerous amenities that help alleviate fatigue and leave you feeling better than when you arrived. Service Express connects you to whatever you need with the touch of a button. Whether you’re seeking extra towels, in-room dining, or recommendations for things to do in the area, simply pick up the phone and we’ll see to it that your request is fulfilled. A multilingual staff, luggage storage service, and disability accessible features ensure all your needs will be met while you’re here.